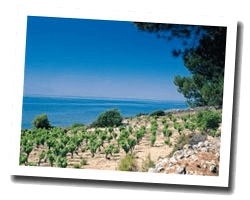 A sheltered bay, a fishing port, terraced vineyards descending to the sea that produce a renowned wine: you are in Banyuls-sur-Mer. Do not forget your snorkel equipment to enjoy the underwater nature reserve. At the seaside you can find pebbles and sand beaches and coves. A coastal path offers stunning views of the coastline. 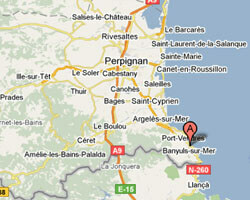 In Banyuls-sur-Mer enjoy a seaview holiday rental. Studio flat 24m2 ideally located, renovated in 2013 with new equipment, in the thalasso center. Large terrace sheltered from wind with garden furniture. View of sea and garden. 200m to beach and Troc Creek, 1 km to town centre. 0 Bedroom(s), 0 double bed(s). Final cleaning : included. Price from 280 € to 530 €. 4 rooms house 150 m2. Terrace, garden with outdoor furniture and barbecue. View of the sea and the rocky coast. 4 rooms house 80 m2. Terrace with outdoor furniture. View of the sea. The house is located in the private gated community 'Troc Pinell' and was completely renovated in the years 2003-2005 with exclusive features. You enter the house through a small courtyard where you can set up a garden table for eating. The house has two floors, three bedrooms and two bathrooms. 3 Bedroom(s), 2 double bed(s). Final cleaning : 80 €. Price from 750 € to 1550 €. T2 duplex character, comfort, exceptional sea views. Renovated in 2009 preserving the charm of the old: beams and stonework. 2 Bedroom(s), 2 double bed(s). short stays possibility. Final cleaning : 55 €. Price from 550 € to 905 €. Villa with spectacular and uninterrupted sea views in a gated development that includes a private beach. Price from 990 € to 1990 €.